Director Bill Waterson said the move was "a big statement" and "a small moment of football history". 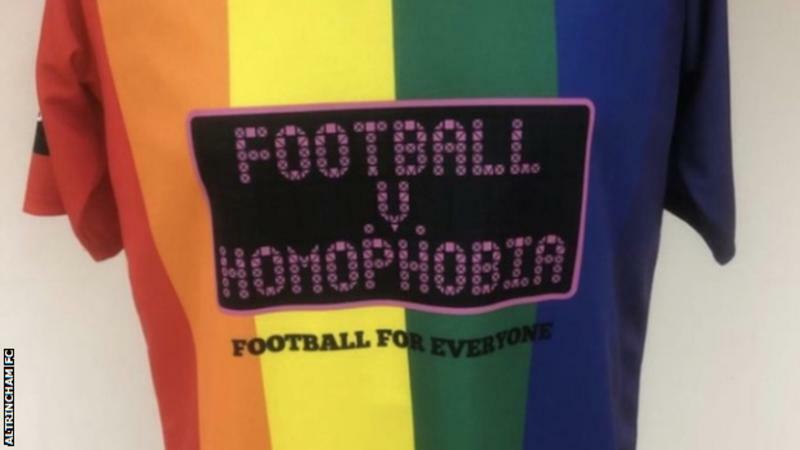 Waterson added: "We believe it will be the first time anywhere in the world that a senior football club has worn a kit solely modelled on the LGBT Pride Flag." The rainbow flag's colours reflect the diversity of the lesbian, gay, bisexual and transgender community. Kirsty Clarke, director of sport at LGBT charity Stonewall, said: "It is great to see Altrincham FC will be showing their support for LGBT people and challenging anti-LGBT abuse in sport on 16 February. "Our research shows there's a huge appetite to kick discri­mina­tion out of sports at all levels and steps like this bring us closer to the day where everyone, from players to fans, are accepted without exception."